One of the biggest trends in wealth management over the past year has been the slew of new products designed to help RIAs launch their own digital advisory channels. Every vendor in the space has realized that they need to be able to check off the robo-platform box when they get an RFP from a prospective client. Adhesion Wealth Advisors recently announced their own attempt at outsourcing digital advice by partnering with Riskalyze and TD Ameritrade. 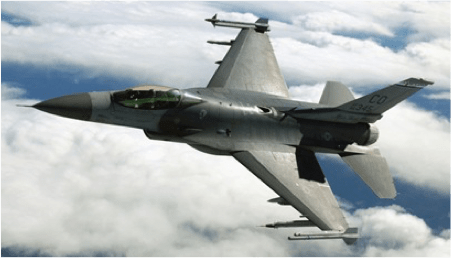 This joint program is designed to block the onslaught of robo-advisors invading their airspace. Will ETF Select bring enough firepower to help advisors counter the incoming online threats? Is Adhesion’s product strong enough to match the offerings from other TAMP, technology vendors and custodians that have already flooded the market? Adhesion seems to be making the right moves at an opportune time in the advisory business. The company is riding a wave of steady growth in the TAMP market, which has been driven mainly by RIAs. Cerulli estimates TAMP adoption with RIAs has grown 20% annually since 2010. Two factors are driving the popularity of TAMPs. The first is organic growth in the retail space. High net worth investors want to work with advisors who can deliver sophisticated investment solutions, from alternative asset classes to hedging strategies. Turnkey platforms give advisors the flexibility and freedom to allocate client assets in specialized investments or personalized strategies, to help solve more complex client needs. The second factor is the shift toward fee-based business from the traditional commission-based model. An SEI survey found 39% of commission-based advisors have changed their fee structure in the last five years, with most of those advisors moving to a purely fee-based model or fee-based with additional planning or retainer fees. This trend is expected to pick up steam with the fiduciary rule changes soon to come from the Department of Labor. With restrictions on commission-based business coming down the pike from the DOL, independent broker-dealers (IBDs) will be keen to move more of their reps into fee-based compensation models. They would prefer their reps use TAMPs to outsource responsibilities for managing investments, so the reps can focus on gathering assets and building relationships. A turnkey program also provides the broker with a consistent, standardized process for client profiling and risk assessment. All clients receive the same experience, which helps compliance officers at sleep better at night. But the environment for digital advice is evolving quickly, and many IBDs will feel pressure from different directions. On one side, their business growth is dependent on the scalability of their in-house technology. A firm looking to jump to the next level can use a TAMP to gain scale, but the cost is high, which eats into their profit margins. There is also pressure from robo-advisors encroaching from the bottom. Traditional advisors have found themselves competing with low-cost challengers for the same clients and assets. 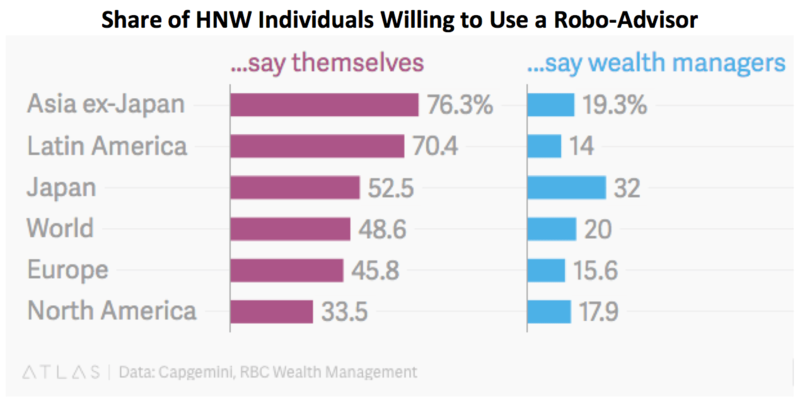 According to a CapGemini, large percentages of HNW individuals around the world would be willing to use a robo-advisor to manage at least part of their wealth. Advisors who can retain clients or bring new clients into their firm with a compelling online experience will be in a better position to compete with their automated counterparts. That’s what Adhesion’s robo-advisor platform promises to do. The concept of delivering open architecture capabilities through a digital channel could be groundbreaking. More investment options can be a boon for advisors looking for advantages when competing against low-cost robo-advisors like Betterment and WealthFront. Advisors using ETF Select will have the option to add on the Riskalyze Autopilot technology to access their risk tolerance score feature plus the ability to enroll clients online. The digital interface streamlines new account opening and quantifies risk assessment and client profiling. Advisors can also use Riskalyze to generate client proposals and search allocations for risk profile mismatches. ETF Select also delivers a wider menu of investment options for advisors to use in client accounts. Most robo-platforms choose to offer ETF options from a single provider. But Adhesion’s robo-advisor offers a wide variety of ETF providers, including Vanguard, BlackRock, Morningstar, Horizon, CLS and Fortunatus. Because ETF Select is only open to firms using TDA as their custodian, the market for Adhesion’s solution is currently limited. But it’s still a significant market—TDA is the second largest RIA custodian in terms of number of clients (5,000, according to 2015 data as reported by Investment News). TDA also stands out from other custodians by fully automating the custodial services through to account opening. This advantage helps Adhesion reduce costs of hiring operational staff to open custodial accounts. Adhesion’s platform gives advisors certain advantages when managing client assets for greater tax efficiency. For example, overlay portfolio management can give an advisor better visibility to a client’s full tax picture when managing multiple investment accounts with different registrations. Transition management—This service helps advisors manage the migration of client portfolios to ETF Select and seek opportunities to lessen any tax hits triggered by the transition by spreading them out over a 2-3 year time frame. Intelligent gain deferral—Instead of a blanket deferral of short-term gains within 30 days of reaching the long-term gain threshold, Adhesion looks at the amount of the gain as well. If the short-term gains are small enough, the small tax bill will not often justify the case for deferral. Liability reduction— To measure tax savings, tax burden reduction looks at the total savings in tax liability achieved given a client’s current tax rate and current tax regulations. 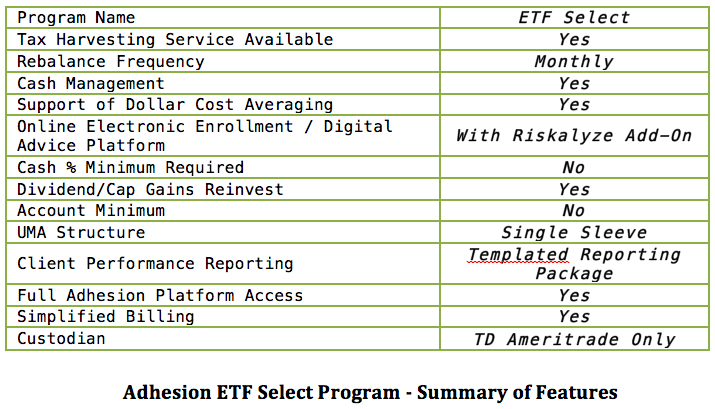 Adhesion has announced an iterative rollout for ETF Select, with the first phase set to begin this month. The first phase will be available to a handful of small accounts without the Riskalyze capabilities on the front end. The next phase will expand the availability of the platform to a wider market, before the planned full rollout by mid-year 2016, which will include the Riskalyze Autopilot functionality. It’s a prudent approach that gives Adhesion the opportunity to gather feedback from the first advisors on the platform and fine-tune the features for future phases of the rollout. Adhesion is on the right flight path with ETF Select, and the announcement of the digital platform couldn’t come at a better time in the industry. While Adhesion claims to be first to market, they are not the only firm interested in carving out a space in this niche: Vanare has a similar digital advice program they’ve launched in a partnership with FolioDynamix and has attracted over $1.5 billion in assets in under 18 months. But will these programs deliver the advantage advisors and firms need to compete head-on with robo-advisors? For ETF Select and any digital advice program to work effectively, the features have to work together. True automation should be the goal, and Adhesion is on the way toward delivering that. Success will hinge on their ability to deliver a high-powered platform that lets advisors beat the low-cost robos at their own game. John Clinton contributed to this article.